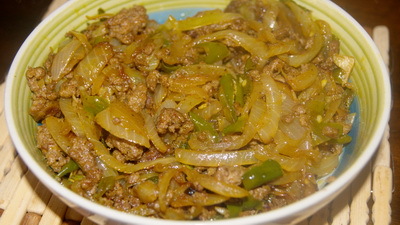 All my cooking efforts is making me nostalgic about my family, friends, childhood and specially my country (Bangladesh). If my cooking gives you same sort of feelings, I will consider my efforts to be successful. 1. Heat the pan with oil and add sliced onion. 2. Cook it till it becomes little bit soft and add all spices and salt. 4. Preheat the oven on 150˚C or 300˚F (in the case of fan force oven will be less temperature). 5. 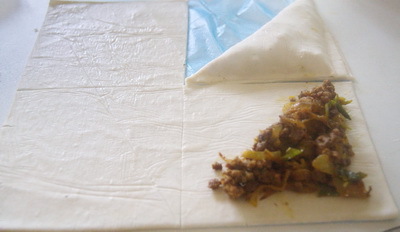 Cut the puff pastry sheet into 4 square size pieces and place the meat stuffing. 6. Fold it and make triangle and place on baking paper. Do same process to rest of puff pastry sheets. 7. 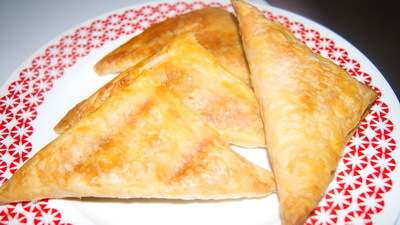 Bake these triangles about 1.20 hr and need to turn over after 50 minutes or when it becomes golden brown. 8. When both sides of patties will golden brown, remove from oven and rest it 5-8 minutes. Leeya its vary on puff pasty brand. amar pure nai ta to photo-te dhekhte parcho..